One gentleman often came to visit Babaji Mahārāja and kept asking him for his mercy. One day, Baba finally became impatient; he took off his kaupīna and handed it to the gentleman and said, ‘You want my mercy? Here it is—take it.’ The visitor was frightened by the manner in which Bābā challenged him. We have heard that all perfections come from the grace of the Vaiṣṇavas, but we do not have the sincerity necessary to really take their blessings when they are given. What is the use of repeatedly imploring them to be merciful if we don’t mean it? This article is based on other articles that previously appeared in the old Gaudiya magazine and various statements made by Śrīla Bhakti Siddhānta Sarasvatī Gosvāmī Ṭhākura and his disciples who knew Vamsi Das Babaji personally. Śrīla Vamsi Das Babaji appeared in the village of Majidpur in the Jamalpur district of Bangladesh, near the city of Jamalpur. Before the partition of India, this city was formerly in the district of Mymensingh. According to Haridas Das, his father’s name was Sanatan Malobrahma and he was previously known as Bhairava. 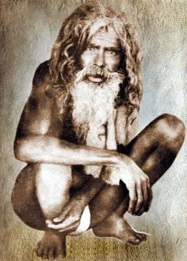 Babaji Mahārāja came to Nabadvīpa from East Bengal. He was a paramahamsa Vaiṣṇava who acted in the manner of an avadhuta. The word avadhuta refers to one who has shaken free from all worldly feeling and obligation. He does not care for social conventions, particularly the Varnashram Dharma, and he is quite eccentric in his behavior. Nityananda Prabhu is often characterized as an avadhuta. Vamsi Das lived in Nabadvīpa under a tree on the banks of the Ganges, demonstrating a very high standard of renunciation. Śrīla Bhakti Siddhānta Sarasvatī Gosvāmī Ṭhākura was attracted by his Vaiṣṇava behavior and his disregard for the rules and regulations of society at large. Śrīla Prabhupada himself paid his obeisances to Babaji Mahārāja from a distance, but did not allow his disciples to associate with him. For though Babaji Mahārāja was a paramahaṁsa Vaiṣṇava, an ordinary beginner in devotional practice would likely misunderstand his indifference to the rules and regulations and end up committing offenses at his feet. The primary purpose of the rules and regulations is to bring pleasure to Śrī Śrī Radha and Govinda. A practitioner who has not yet overcome his mundane conditioning may very well judge an advanced Vaiṣṇava according to rules and regulations which were designed to help him advance to the next level of spiritual realization. If he measures a perfected soul by the standards which have been set for the beginner, there is a possibility of committing offenses which could result in falldown from the devotional path. It is said that Babaji Mahārāja had two cloth bags. He kept his Nitai-Gaura deities in one, Radha-Govinda in the other. He regularly worshiped them, taking them out of the bags and serving them mentally with mantras. Then, when he had finished, he would place the deities back in their bags. On occasion he would leave them outside so that people could look at them. Once in a while, he would offer tobacco to Radha and Govinda in a hookah—but not to Nitai Gauranga. Many people would come bringing offerings of rice, fruits, vegetables, flour, or bananas, but Babaji Mahārāja would ignore them. When he noticed an accumulation of such offerings, he would mentally offer them to his deities and then distribute the remnants to whoever happened to be present. Who can understand such enigmatic behavior? Babaji Maharaj was tall enough to be able to pick fruits for his puja from the high branches in a tree without making use of ladders or other paraphernalia. On one occasion, he fell from a tree and from that time on he took on the guise of a lame person. He only wore a kaupīna, a strip of cloth covering his private parts, and left his hair and beard uncut and unkept. Babaji Mahārāja did not stay exclusively in the Nabadvīpa area, but travelled to many holy places where he also performed his spiritual pratices. He embodied the verse Kṛṣṇa-bhakti-rasa-bhāvita-matiḥ, and wherever he went he always remained immersed in the ocean of Kṛṣṇa-rasa. Therefore, everything reminded him of Kṛṣṇa-lila, but especially the peepal or bata tree. Whenever he saw a peepal tree, he would sit under it, taking it to be the Vamsi Bata under which Kṛṣṇa played His flute to attract the gopis. Once he had stationedhimself there, it would be difficult to get him to move. On the 12th of Phalgun, 1347 (Monday, Feb. 24, 1941), Vamsi Dasji left Nabadvīpa city and headed for Vrindavan. He sometimes walked, sometimes he travelled by ox-cart and sometimes by rail. He first went to Katwa where he stayed for two days under a baṭa tree near the train station. Then he took the train to Bhagalpur where he stayed for one day under a baṭa tree near the station and for four days by the Ganges. Then he travelled on to Gaya where he remained on the banks of the Phalgu River for three days. He also stayed on a boat in the Ganges near Dasasvamedha Ghat in Benares for three days, spent another three days in Ayodhyā by the Sarāyū river including three hours under a baṭa tree, at the Triveni confluence at Prayag for ten days, two days at the Vishram Ghat in Mathura, eight days at the Vamsi Bata in Vrindavan, nine days at the Madhyachura on the banks of the Yamuna, one day at the Govindaji temple, two days at Kalidaha, eight days under a tamal tree on the east bank of Surya Kund at Nandagram, two days at Pavan Sarovar, four days at the foot of a pilu tree, and then another nine days at Vamsi Bata Ghat in Vrindavan. Everywhere he went, he remained absorbed in chanting the Holy Names and meditating on Kṛṣṇa’s form and pastimes. After three months, he returned to Nabadvīpa Dham, in the month of Jyestha. Those who travelled with Vamsi Das recounted that when wandering through Vraja Mandala, he would sometimes sing songs about Kṛṣṇa’s lila, sometimes glorify Nabadvīpa Dham, sometimes laugh madly. Sometimes, he would babble incoherently, and oftentimes he would remain completely silent. When visiting a temple, he was often seen muttering confidentially to the deities, disclosing some personal sentiment to them. All in all, his companions were charmed by his devotional absorption. In the old Gaudiya weekly magazine, further accounts of Babaji Mahārāj’s travels were given. It is stated there that between 1943 to 1947, he travelled to Ambika Kalna, Kharagpur, Baleshwar, Soro, Bhadrak, Khorda Road and Purushottam. Afterwards, he again visited Gaya, Kashi, Saidpur, Patna, Munger, etc. After travelling to all these places, some devotees from his birthplace in Majidpur invited him to come for a visit. He acquiesced to their enthusiasm, but found little pleasure in going. He said that it was a place, which the Pandavas had neglected. The founding acharya of the Chaitanya Gaudiya Math, my spiritual master, nitya-lila–praviṣṭa Oṁ Viṣṇupada Srimad Bhakti Dayita Madhava Gosvāmī Mahārāja told his disciples a story about a personal encounter he had with Vamsi Das Babaji. Gurudeva founded an ashram in Midnapore city, the Shyamananda Gaudiya Math, with the help of two of his godbrothers, H. H. Bhakti Vichar Jajabar Mahārāja and H. H. Bhakti Kumud Santa Mahārāja. On one occasion, Babaji Mahārāja was travelling and passed through Midnapore. When Gurudeva received the news that Babaji Mahārāja was coming with a group of devotees by ox-cart, he immediately sent a disciple to invite him to visit the Math. Babaji Mahārāja promised the disciple that he would come and so Gurudeva started to make preparations to receive the party of pilgrims. However, after the midday offering and arati, no one from Vamsi Das’s party came. Śrīla Gurudeva waited for some time and finally took a number of his disciples and went looking for him. When Vamsi Das had entered the city with his party, he had seen a peepal tree and had taken it to be Vamsi Bata. He had camped there and made arrangements for making an offering to his deities and feeding his party there. When he saw Gurudeva, Babaji Mahārāja remembered his affection for Śrīla Prabhupada and offered him some sweet rice prasad, which Gurudeva accepted respectfully. I often heard Gurudeva say how delicious the sweet rice tasted that day. My siksha guru, Srila Bhakti Pramode Puri Gosvāmī Mahārāja, also told us afew anecdotes about Vamsi Das Babaji, incidents that he had witnessed personally: “Once, a pile of fruit intended for the service of the deities had accumulated at Babaji Mahārāja’s cottage by the Ganges and Baba would not let anyone lay a finger on it. One day, however, a cow entered the cottage and ate all the fruit. Though they tried, no one was able to drive the cow away.Meanwhile Babaji Mahārāja watched and laughed, clapping his hands. Out of curiosity I asked Baba’s disciple, whose name was Purna or Puṇya, why Baba was laughing. He said, ‘Last night a thief stole all the deity’s pots and pans, dishes and utensils. Now a cow has come and eaten all the fruit. So he is beside himself with joy and is laughing and saying, ‘One thief gives and another thief takes away!’Kṛṣṇa is the supreme thief. “Babaji Mahārāja enjoyed hearing devotional songs. One day, he heard Bhaktivinode Ṭhākura’s couplet, tyajiyā śayana sukha, vicitra pālaṅka, kabe vrajer dhulāya dhūsara habe aṅga — ‘When will I give up the pleasure of sleeping in a comfortable bed and roll in the dust of Vrindavan?’ Babaji Mahārāja said, ‘You are only singing a song. It only bursts open for those who have burst open.’In other words, we only sing the songs of the Mahajans, but we feel no emotion. When the dust of the holy places covers our bodies, we only think of brushing it off. We have no real idea of its value. Babaji Mahārāja was normally occupied with his devotional activities; he minded his own business and spoke little. He would talk to his deities, sometimes laughing, sometimes crying desperately, but he did not speak much to others. Many people would come to him; often they would ask him questions. Mostly he remained silent, and if he took any notice at all, he would usually answer indirectly. If he did give spiritual instruction, he would rarely cite scripture, but always spoke from his personal realization. In two or three short phrases, he was often able to make a deep impression on the listener. Those who visited him occasionally reported the short answers that he gave to their questions. Some of these were noted and are given here. Q: Baba, what should we do? A: If you worship Nitai, you will get Gaura. All your unhappiness will disappear and you will begin to feel real joy. Q: How can one become free from the demands of the senses? Q: Baba, is here no happiness in this world, then? A: There is no joy here, unless you worship Gaura-Nitai. That is our eternal world, while this world of yours is an illusion. Happiness in this world is like the laughing or crying of a dreaming baby. 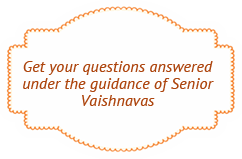 Q: How can we tell if we have received the blessings of Kṛṣṇa or the Vaiṣṇavas? A: je kare tomāra āśa, tāre koro sarva-nāśa — “You ruin everything for someone who aspires to attain you.” kāhāke-o ṭākā dey, kāhāro ṭākā nei — “To some He gives money, while He makes others penniless.” Tomā sthāne aparādhe nāhi paritrāṇa — “There is no pardon for an offense at your (Vaiṣṇava Ṭhākura’s) feet.” How can you stop it, if it comes? Who else will deliver you? If I try to explain, who will understand me? I haven’t got the slightest bit of attachment to the Vaiṣṇavas. Q: How will I attain Kṛṣṇa’s mercy? Q: How can we be happy? In renunciation or in enjoyment? A: There are saintly persons on the Sarayu who chant the names of Sita Rama. They are happy, they know no distress. Those who stay with King Duryodhana know no joy. Those who were with Yudhiṣṭhira are happy. Happiness and distress—enjoyment and renunciation– are twins. Some people enjoy and some renounce. Q: Have you ever been to Mayapur? A: Yes. Some call it Mayapur, some call it Nabadvīpa. There are buildings all over the Mayapur temple site and the deity is worshiped under a neem tree. I once went to Mayapur with a torn wrapper and a waterpot. Sachinandan Gosai(Mahāprabhu) came and took my waterpot. I sat down and waited and a few minutes later Sachinandana Gosai came and gave it back. Then I came back here. Babaji Mahārāja’s disappearance day was the Shravan Śuklā Caturthī.